A number of readers asked for a fact check of this statement by the vice president. Pence made it one day after he forcefully confronted Aung San Suu Kyi, the de facto leader of Myanmar, over the continued imprisonment of two Reuters reporters who documented the military’s role in the persecution of the Rohingya ethnic group. Hundreds of thousands have fled the country, also known as Burma, for neighboring Bangladesh. He urged her “multiple times” to pardon the two reporters, a White House official told reporters. Pence said “the administration” has stood for a free and independent press. What about the president? The story that unfolds is schizophrenic. Moreover, on numerous occasions, Pence’s staff pushed back against foreign governments that sought to limit press access for U.S. journalists, such as in Korea, Singapore and Egypt. Meanwhile, the State Department provided the Fact Checker with an impressive list of more than 25 statements made by senior officials on press freedom. “The United States is a steadfast supporter of freedom of the press around the world. It is a cornerstone of democracy, and is essential to transparency and accountability. The media plays a critical role in promoting vibrant debate, informing citizens, and providing a forum to express differing points of view, particularly on behalf of individuals whose voices are not heard in society,” said spokeswoman Heather Nauert, a former journalist. Nauert noted that the State Department assesses press freedom in countries in its annual human rights report and has worked to highlight the plight of Uighur journalists in China and the selective targeting of reporters in Russia and has called for the immediate release of the Reuters journalists detained in Myanmar. But the tenor of an administration is set by the president. And the president’s words — the phrases he utters and the tweets he makes — tell a different story, according to a comprehensive record maintained by factba.se. His commentary about the media is virtually all about how it affects him, especially if he thinks the news coverage is negative. One searches in vain for statements that mirror the language of Pence or State Department officials. Actually, that’s the core of the First Amendment. News organizations have a responsibility to get it right — and good ones correct their mistakes — but as the Supreme Court made clear in New York Times v. Sullivan (1964), a public figure must be able to prove a news organization knew a statement was false or recklessly disregarded whether it was false before libel can be considered. The 9-0 ruling setting a standard of “actual malice” notably came in the context of the civil rights movement, as Southern officials repeatedly filed defamation suits to thwart coverage of civil rights. Once he became president, Trump railed against “fake news,” which he has deemed the “enemy of the people.” In a tweet nearly a month after taking office, Trump name-checked four television networks and the New York Times as “fake news” and the “enemy of the American people.” These are all well-established, professional news organizations, with high standards and a commitment to correcting errors. But Trump has falsely said they make up sources. Trump has repeatedly claimed that when he uses the term “fake news,” he is not decrying the news media at large, just what he appears to view as negative news stories. The problem is that presidential words have consequences — and reverberate around the world. The nuances that Trump claims he is making appear to be misunderstood overseas. Now, all sorts of odious regimes use the expression — including Myanmar, where a government official said: “There are no such thing as Rohingya. It’s fake news.” In Libya, after a CNN report showed migrants being sold into slavery, Libyan officials used a tweet by Trump calling the network “fake news” in an attempt to discredit the story. “It’s frightening,” said Lucy Dalglish, dean of the Philip Merrill College of Journalism at the University of Maryland. “We are getting away from core democratic practices and beliefs here.” She said that Trump’s attacks on the media have polarized the nation and that his “language has emboldened people to behave badly” in other countries. Dalglish noted that Pence has long been a strong supporter of independent media and that other parts of the administration — such as in the State Department and other agencies — also continue to promote press freedoms. “But it’s certainly not going on in the Oval Office,” she said. Chris Wallace, in his “Fox News Sunday” interview that aired Nov. 18, sought to pin Trump down on the fine line he appears to draw between “fake news” and the media. Trump asserted that “nobody believes in the First Amendment more than I do” and that “I don’t mind getting bad news if I’m wrong.” When Wallace noted that “leaders in authoritarian countries like Russia, China, Venezuela now repress the media using your words,” Trump rejected any connection and passed up the opportunity to reaffirm his belief in freedom of the press. “I can’t talk for other people, I can only talk for me,” he said. On the rare occasions the president has spoken about freedom of the press, it is in reference to himself. Pence is a part of the Trump administration, and his statements promoting press freedom, especially his comments on the Reuters reporters and Khashoggi, are noteworthy. The State Department also has highlighted press freedom. That’s one arm of the government. But it’s impossible to ignore the elephant in the room — the man Pence and State Department officials work for. The president repeatedly uses phrasing that belittles and demeans the news media, so much so that “fake news” is now a tool used by autocrats and dictators. The president from time to time drops in a reference to “freedom of the press,” but it’s when he is talking about how he is treated by the media. There’s never been a stand-alone statement, fulsome and complete, like the statements that effortlessly are made by Pence, especially in foreign settings. No one has a bigger megaphone than the U.S. president, so the laudable efforts of the rest of the government often are smothered by the fury from the White House. Pence, speaking just for himself and the State Department, would earn a Geppetto. 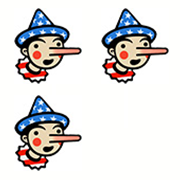 But speaking for the administration at large, his claim is worthy of Three Pinocchios.